To make the crust, in a large mixing bowl, stir together flour, 3 tablespoons sugar, salt and baking powder. Work the butter in, using a pastry blender or your fingers, until pea-sized lumps form. Sprinkle in the water, 1 tbsp. at a time, stirring gently with a fork after each addition and adding only enough of the water to form a rough mass. Meanwhile, stir together cherries, dried cherries, 3/4 cup sugar, cornstarch and vanilla extract until well combined. Roll one dough disc out thinly on a floured surface, using a rolling pin, and fit into a 9-inch pie plate, place on a cookie sheet; fill pie shell with cherry mixture. Roll out additional dough disc and top cherry mixture; trim and flute edges. Slice some cuts in the center of pie. Whisk together egg and cream in a small bowl and brush evenly over pie dough. Bake for 1 hour-1 hour and 10 minutes, or until deep golden brown. Cool completely on a wire rack. 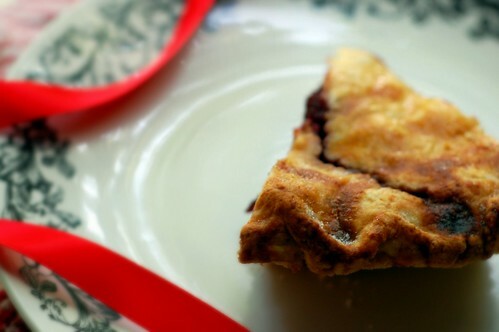 36 comments on "Ultimate Cherry Pie"
The pie looks delicious! I love fresh cherries in the summer! oh no you didn't! I am making a cherry pie with my sour cherries :) today methinks... now that i'm not sweating standing in my kitchen. Beautiful pie! I'm one of those who "thinks" she doesn't like cherry pie...but I've only had it with the super sugar and sour cherry pie filling. I bet yours is a million times better! I ve never made a cherry pie. This surely cheers me up if I had it though. It looks delicious! Oh MG, I'll never be able to make this. My family won't allow me. Cherry always vanish way too quickly before I get my hand to do anything. I must admit that I am so tempted right now. Indeed look like the ultimate Cheery pie! I hope the cherry pie helped everyone. It looks good enough to have been a wonderful source of comfort for folks. YUM! THis looks great. I too use to hate any type of pie... esp cherry pie, but now i love all types. That cherry pie looks beyond ultimate, if that's possible. It's beautiful! I can only imagine how wonderful it must taste. 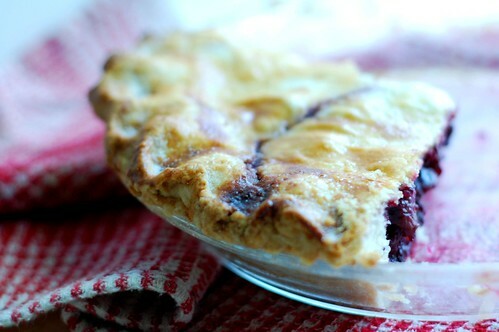 Cherry pie is one of my very favorite things -- and the idea of making it with fresh cherries is making me drool. Seriously good stuff! As usual you have made me drool over the computer Emily! Looks delicious! Hope you're okay, Emily... we're thinking of you and your family. I also used to think I didn't like cherry pie... now I think I love it. Good choice! I just got back from being out of town yesterday and have been catching up on my blogging today. I am so sorry about your grandma. I do know how you feel. My grandma was THE most important person in my life. I learned more from her than anyone. I'm so glad you had a wonderful grandma and you will treasure all your memories. My husband wants blueberry pie, so I was wondering to use this recipe with the exception of using blueberries. Any changes you'd make? I decided to just go with your original recipe instead of the blueberry version. It smells so good, it is in the oven right now. Can't wait to try it. Mmmmm, it looks amazing! Cherry pie has always been my favorite and I love your version!! Looks wonderful! 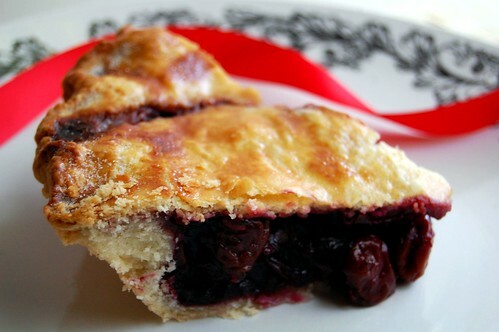 I definitely want to give Cherry pie a try very soon. It looks scrumptious. Love the simple fresh ingredients. My ex-husband used to cringe at that fake cherry pie you spoke if. Now I understand. Wow that looks amazing! The pie crust looks so flaky and perfect. 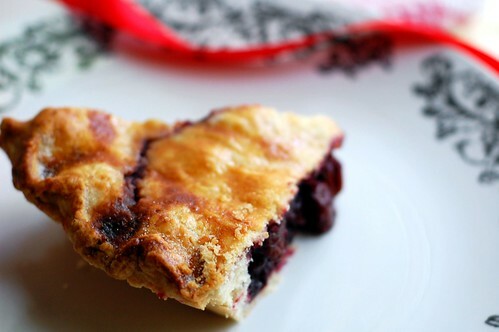 Your ultimate cherry pie looks georgous! A true winner!! I have cherries in the fridge and altho I'm not a baker, I'm going to give this a try! yeah, that neon red canned stuff can't hold a candle to fresh cherry pie filling. this is glorious, emily! This is looking so scrumptious! I love Bing Cherries and love even more that they are cheap. You can't eat to many of them. I have yet to taste a fresh Cherry pie, I think it is high time that I do! This looks ammmmmazing! I really want to bake a pie before the summer ends. I have never made a pie from start to finish and now that I think about it - that needs to change asap! YUM! I love cherries! Even the fake ones they put on your ice cream sundae, though I don't like the fake cherry pie filling. I think that would downgrade me in my love for food. lol. It looks great though and the crust...oh so flaky! Yummy! I love cherry pie...it's so summery-y! Love the pie...well, I love ALL pies....especially summery fruit pies. Nice! Perhaps this is my first time encounter a pie crust using cake flour! I definitely need to follow your recipe's instruction! Your pie looks absolutely amazing! Thanks for posting and for sharing this wonderful recipe! Pie really is a great comfort food. I love that you used fresh and dried cherries. It looks delicious! Aww, thanks foor baking us all cherry pie - it looks fantastic! I have nearly a kilo of cherries in the fridge, so this looks like a tempting way to use at least some of them. It really looks like it turned out well! I like that it's not runny or soggy looking. Great job Emily!